For an artist whose work was inspired by a lifetime of journeys, William Congdon’s art has travelled surprisingly little. The pieces on display in William Congdon: American Modernist Abroad, co-curated by Dr Donal Cooper and third year History of Art student Alessandro Rubin, have never been shown in the UK before. 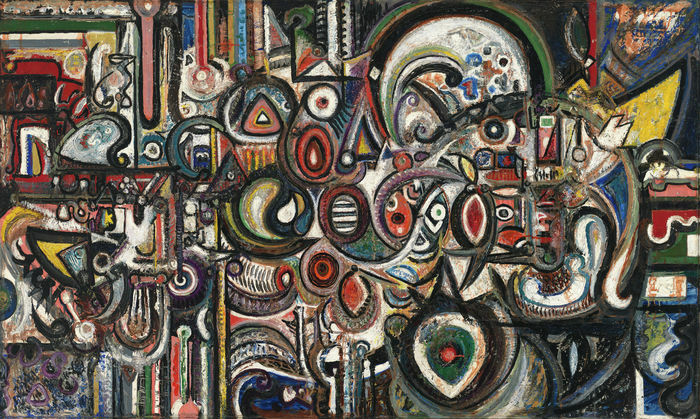 Although his paintings are well-known in America and Milan (where he spent the majority of his life), they do not often appear in collections elsewhere. This is partly because Congdon spent the last twenty years of his life living as a monk in total solitude, according to art historian Professor Paolo Biscottini of the Catholic University in Milan. For Congdon, art was “like breathing”, says Biscottini, who knew the artist personally. From childhood onwards, Congdon saw the creative outlet that art provided as a necessary part of his existence, intertwined with his own personal and spiritual identity. The Milan-based Congdon Foundation explains on their website that the somewhat troubled painter “first took up art to find a space in which to define himself” after struggling throughout his early years due to a difficult relationship with his father. Born in Providence, Rhode Island, the American artist’s early scars were only multiplied when the arrival of World War II led him to encounter human suffering on a different scale. He worked as a volunteer ambulance driver in Europe from 1942 and was one of the first Americans to enter the Bergen Belsen concentration camp. After its liberation he spent a month working there – surrounded by piles of corpses and tormented civilians. It was this experience that would define Congdon’s work from then on as he became known internationally as one of the leading American painters in the 1950s. Although he is generally recognised as an abstract expressionist, Biscottini was keen to challenge this notion in his talk at the opening night of William Congdon: American Modernist Abroadin Jesus College’s West Court Gallery. “Congdon was not a painter of abstract expressionism”, says Biscottini firmly – and somewhat surprisingly given Congdon’s frequent association with this movement. “He worked in the figurative abstract”, the professor explains. This concept is perhaps the key to understanding the often-challenging canvases of this exhibition. When one is first confronted by their ambiguous subject matter, depicted using multiple layers of thick impasto that have been manically scratched away to create lines, it can be difficult to decipher the underlying message. The combination of landscapes from various countries with the occasional recognisable structure such as the Eiffel Tower tells the story of Congdon’s trips across the globe. Biscottini explains that the compulsive traveller used his work to express what he felt in a place – not necessarily what he saw. Common to all of these scenes is the quiet but acute presence of death, human violence and war. These themes are underpinned by a palette which ties the whole exhibition together: dusty browns, murky greens and the heavy use of black as a base colour – revealed once the other layers of paint have been removed. There are subtle signs of human suffering in the skeletal shapes scraped into the rather apocalyptic black, brown grey horizon of ‘Stazione di Calcutta’. Congdon doesn’t give us enough detail to confidently define any recognisable objects in this stark piece, yet the slight suggestion of bones is enough to make us picture a mass grave. Indeed, the viewer’s uncertainty is perhaps the most unsettling effect of his work; we are left feeling uncomfortable but without being able to pinpoint exactly why. Congdon’s paintings are the result of an artist’s inner turmoil, and we are left with a slight aftertaste of this struggle in ourselves. In most pieces, it is unclear where manmade destruction ends and the land begins. This blurring of the boundary between man and earth is symptomatic of the deeply spiritual aspect of Congdon’s art. Having converted to Catholicism later in life, he used his work to tell the story of the religious identity which was slowly revealed to him. Biscottini explains that, through painting, Congdon was able to see everything as an epiphany. The exhibition seems to me to portray a somewhat tormented spirituality. From a distance, there is a certain bleakness to the neutral-toned works with their angry, agitated black marks. Many appear to depict some kind of post-apocalyptic, biblical scene, where nature’s hues have been replaced by dark, barren tones. Upon closer inspection, however, pops of colour such as bright blue or green jump out of the paintings in surprising places – suggesting the works went through many stages before the final layer of paint was added. This and other elements of Congdon’s painting method can only be truly appreciated or even noticed in the flesh. On some canvasses, shimmering powder has been added to create a metallic effect. A striking feature I noticed in all of the works on display was the distinct lack of brushstrokes. Most of the paint has been applied with a palette knife and then scraped away with different tools to create contrasting textures; we are left with a lot of rough edges and expressive, sketchy lines. Overall, William Congdon: American Modernist Abroad is a bold and inquisitive exhibition, tracing the journeys of a troubled soul and his relationship with the world. Whilst aesthetically the works may not be particularly accessible, they certainly merit further investigation in order to appreciate the extent of their meaning. Like the layers of paint which characterise Congdon’s work, the image on the gallery wall is only the visible layer of this artist’s creation; there is much to be discovered beneath the surface. William Congdon: American Modernist Abroad, co-curated by Alessandro Rubin and Dr Donal Cooper in collaboration with the Fondazione Congdon in Milan, will be exhibited at the West Court Gallery, Jesus College, Cambridge until 3rd March 2019.